This picture shows number 2 Wilford Crescent West, The Meadows, Nottingham during the flooding of 1947 - the flood waters were just beginning to recede. The shop was a gents hairdressers run by Arthur Millar. In the photo are left to right: Fred Fox, Lily Millar, Arthur Millar and Annie Fox. (Lily and Annie were sisters). Malcolm Fox (the son of Fred and Annie Fox) who supplied the photo, lived at number 8 Wilford Crescent West from 1947 until 1971. This page was added by H W on 19/09/2011. The shop pictured is a gents hairdressers - 2, Wilford Crescent West, Meadows, Nottingham. The business was operated by a Mr. Hemstock from about 1914 to the early 1940's. Arthur Millar was apprentice and later assistant to Mr Hemstock until the latter retired. Arthur then took over the business until he died in November 1957. 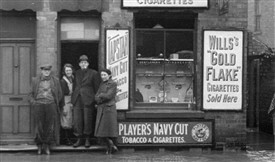 The shop was licensed to sell cigarettes and tobacco - I used to often watch the songwriters at work. Just to clear things up! !